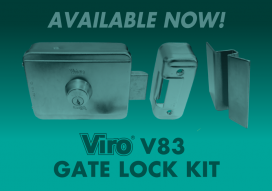 The Viro V83 Gate Lock Kit Supersedes the Viro V90 Gate Lock. The V83 is an electric solenoid pulse lock. Complete with receiving slot-plate, it suits both vertical and horizontal applications. Available with an optional Horizontal or Vertical Roof-Plate to help protect against vandalism. Contact Us Today to buy a V83 Gate Lock Kit!